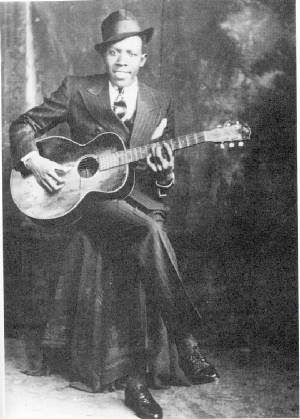 Robert Johnson was born on May 8, 1911 to Julia Major Dodds and Noah Johnson in Hazelhurst, Mississippi. Until his late adolescence, his name was Robert Spencer after his stepfather, who had to change his name from Dodds to Spencer. Johnson took the name of his natural father as a teenager, even though he had not met him. Music was a long-time interest for Johnson, and his first instruments were the Jew's harp and the harmonica. Before he became seriously involved with the guitar, he married Virginia Travis in February 1929, and the young couple soon became expectant parents. But tragedy struck when Virginia, only sixteen years old, died in childbirth in 1930. Unhappy and unwilling to be caught in the sharecropper's world of backbreaking work with little reward, Johnson left the regular scene around Robinsonville, Mississippi and went to Hazelhurst, MS. There he played at the "jook joints of the road gangs and lumber camps," and found a "kind and loving woman more than ten years his senior" named Calletta "Callie" Craft. The couple was married in May 1931, but they kept the marriage a secret. The time in Southern Mississippi was very important for Johnson, because his musical talent came to fruition. When he returned to Robinsonville, Son House and Willie Brown were astounded by his development. In performance, Johnson played his own songs as well as those of other bluesmen and generally popular music by performers such as Bing Crosby. When he made up his mind to record, in 1936, he approached H. C. Speirs, a white record store owner in Jackson, MS. Speirs sent him to Ernie Oertle, an ARC scout. Oertle and Johnson went to San Antonio late in November 1936, where, in 5 days, he recorded Kindhearted Woman Blues, I Believe I'll Dust My Broom, Sweet Home Chicago, Rambling On My Mind, When You Got a Good Friend, Come On In My Kitchen, Terraplane Blues, Phonograph Blues, 32-20 Blues, They're Red Hot, Dead Shrimp Blues, Cross Road Blues, Walking Blues, Last Fair Deal Gone Down, Preaching Blues (Up Jumped the Devil), and If I Had Possession Over Judgment Day. When he was done, he returned home to Mississippi. Johnson returned to recording in June of 1937, this time in Dallas. He did two takes each of Hellhound On My Trail, Little Queen of Spades, Malted Milk, Drunken Hearted Man, Me and the Devil Blues, Stop Breakin' Down Blues, Traveling Riverside Blues, and Honeymoon Blues, and three takes of Milkcow's Calf Blues, and four takes of Love in Vain. the life and music of Robert Johnson.